By Michael Sena, C.F.S.with Kirsten Straughan, R.D., L.D., and Tom Sattler, Ed.D. It may seem as if it will be an uphill battle to get your family to switch from heavily advertised sodas, energy drinks, and sugary drinks that are sold as juice to healthier beverages such as water and milk. Believe me, though, it's a battle worth fighting. The high intake of these sugar-sweetened drinks has been a driving force behind the high incidence of obesity among our children. Did you know that one 12-ounce can of soda has 10 teaspoons of sugar? I'm sure that none of you would knowingly give that much sugar to your kids with their meals or snacks. Soda drinkers are also more likely to have a lower intake of important nutrients, such as vitamin C, vitamin A, folate, magnesium, and calcium. The decrease in calcium can result in reduced bone mass, which can contribute to broken bones in children and can possibly lead to osteoporosis later in life. There are two ways to win this battle. One is to make sure everyone understands just how dangerous sugary drinks can be. Let your kids and spouse know that these drinks are leading culprits in weight gain and dental problems and how the lack of dairy-based drinks can lead to broken bones. The other necessary tactic is to provide healthier choices that your family will learn to love. As you are convincing your family to decrease their sugary drink intake, you can introduce them to these better choices. Water. Whether it is flat or fizzy, flavored or plain, water is a fundamental component of your family fitness plan and is the perfect beverage for everyone. It helps to fill you up and is important for many bodily functions. There are many drinks masquerading as water that still have sugar or artificial sweeteners added. Check to be sure the label lists no calories or artificial sweeteners so you get the real deal. Show your kids that the ever-present water bottles that lots of pro athletes, teenagers, and health-conscious young adults carry with them are healthy and cool! Here are some ideas for making water more appealing to your kids. 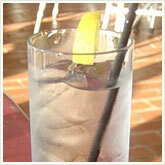 Have plenty of flavored seltzer waters available as an alternative to plain water. Use fresh lemon, lime, or other citrus fruit slices in your water. Or try cucumber slices for a refreshing taste. Always keep water bottles in the car or in your kids' backpacks to encourage water consumption. Milk. Low-fat and fat-free milk are healthful beverage alternatives. Next to water, low-fat or fat-free milk and soy milk are the best beverage options for your family. Milk contains calcium, which we often don't get enough of, as well as protein. Soy milk is a great alternative to cow's milk, especially if you are lactose intolerant, have problems with chronic upper respiratory infections (sinus infections or ear infections), have asthma, or are just looking to include more soy in your diet. Chocolate milk is okay for an occasional treat; just try to control the amount of chocolate added to keep the sugar under control. 100 percent fruit juice. 100 percent fruit juice is just that -- it is made solely from fruit with no sugar added. Fruit juice has the added benefit of being full of the vitamins that are naturally found in fruit, such as vitamin C and folate. It's very important to remember, however, that a serving is only 4 ounces. The typical juice box is 8 ounces, and many bottles can be up to 20 ounces. I would suggest limiting the total amount of juice for the day to 4 to 8 ounces. If 8 ounces is much less than your family is used to drinking, dilute the juice with water. Start with 25 percent water and 75 percent juice, then slowly increase the percentage of water to 50 percent. Or try mixing juice with seltzer water for a fizzy treat. Vegetable juice. Vegetable juice is a great low-calorie choice that offers antioxidants, such as vitamins A and C, and other nutrients such as lycopene, which has been linked to a reduced risk of prostate cancer. Eight ounces of vegetable juice has 2 grams of fiber, is very low in sugar, and has only 50 calories. Unsweetened teas. Unsweetened teas -- those that are already bottled -- and homemade iced or hot herbal teas can be great calorie-free options. Black and green teas also have proven health benefits, such as decreasing your risk of cancer and lowering cholesterol. Many herbal teas taste sweet enough on their own, so you don't need to add any extra sugar or honey. If they don't, try adding a small amount of 100 percent fruit juice for a delicious blend. Teas come in many family-friendly flavors, such as berry, orange, and cinnamon, so you have plenty of options to try. When buying bottled teas, be sure to check the nutrition labels to make certain they have no calories. Sports drinks. Sports drinks are very popular among kids, due in large part to great marketing and advertisements. Sports drinks contain only about 50 to 80 calories per 8 ounces, making them lower in calories than juices, fruit drinks, and soda. They don't, however, offer the nutritional benefits of 100 percent fruit juice, vegetable juice, or milk -- so drink them only occasionally. Water is still the best fluid choice for any activity that lasts less than 60 minutes, making it ideal for a typical workout. Water also won't replace the calories that you're working to burn off! Perhaps some of your favorite drinks aren't described above -- and for good reason. Here's the skinny on some other popular drinks that you'll want to avoid. Diet soda. My tendency is to recommend eating real foods and avoiding artificial sweeteners and fat replacements, such as aspartame and Olestra. Aspartame, a common sweetener in diet soda, has been linked to migraine headaches, among other adverse health reactions. In addition, there is a small amount of preliminary research indicating that your body releases insulin in response to artificial sweeteners. The release of insulin causes your blood sugar levels to drop and therefore makes you hungry. Trying to decrease the amount of sweeteners you use, whether they're natural or chemical, is the best bet. However, allow yourself to enjoy your favorite sweet occasionally, made with real sugar. If you choose to drink diet soda or use artificial sweeteners, do so in moderation (once or twice a week). Coffee drinks. With the rise of the chain coffee houses has come the popularity of creamy coffee drinks that are chock full of sugar and calories. A 16-ounce cafÃ© mocha averages 300 to 350 calories, while a 16-ounce frozen coffee drink can have anywhere from 300 to more than 500 calories, depending on what "extras" you have added. Whipped cream alone can add more than 100 calories! Bakery treats such as banana bread, muffins, and scones have, on average, between 350 and 450 calories, while a caramel sticky roll or slice of coffee cake can have upwards of 700 calories. Yikes! You could easily get more than half of your daily calorie allowance from your coffee break. Fortunately, you don't have to forgo your treat. There are many lower-calorie choices, such as a small cafÃ© latte or cappuccino made with fat-free milk (about 120 calories). You could also try a 12-ounce Chai tea with fat-free milk for about 170 calories. Choose from a selection of herbal teas or, of course, plain old zero-calorie black java. And instead of the muffins or cake, try a crunchy biscotti for around 120 calories. Alcohol. Alcohol is another underestimated calorie source. A 12-ounce beer, a 7-ounce glass of wine, or a 2.5-ounce martini each adds around 150 empty calories. And that can double if you're drinking a tall glass of a creamy mixer such as piÃ±a colada. Also, alcohol tends to lower your inhibitions, so you are more likely to take a few extra bites of dessert. In addition to contributing to extra weight, alcohol has been shown to have differing effects on your health. Moderate amounts of red wine (one drink a day for women and two drinks a day for men) have been shown to lower the risk of coronary heart disease. However, research has also shown that alcohol in higher amounts can be a contributor to cancers of the breast, esophagus, stomach, and colon. Use judgment and moderation when fitting alcohol into your meal plan. Michael Sena, C.F.S., is one of America's most respected personal trainers and fitness experts. His fitness advice has appeared in USA Today and the Washington Post and on CNBC and CNN's Headline News. He was named one of the 100 best trainers in America by Men's Journal in 2005 and is a founding member of Mayor Daley's Fitness Council. He lives in Chicago. Kirsten Straughan, R.D., L.D., is a registered dietitian who has worked in a variety of settings, including hospitals, private counseling, nutrition seminars, and fitness and nutrition television news reports. Tom Sattler, Ed.D., has chaired the graduate specialization in applied exercise physiology at the University of Illinois in Chicago. Dr. Sattler has also supervised training for the NHL's Chicago Blackhawks (1978-1982) and the Chicago Cubs (1982-1988). He is currently the director of education and programming for the Senior FITness division of Alliance Rehab, a Health Resources Alliance company.